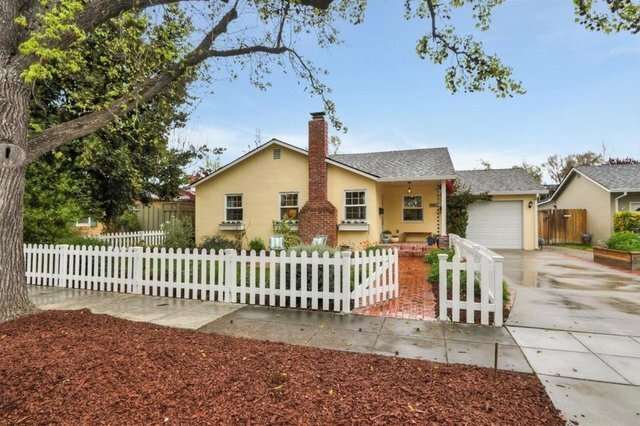 This sunny yellow home with a white picket fence, sits in a charming neighborhood in San Jose. Willow Glen is a beloved neighborhood with treelined streets, parks and a beautiful downtown with shops and restaurants. This welcoming home is in the heart of Willow Glen. When you enter, the family room greets you with a cozy fireplace and a bright and cheery layout. Entertain in your formal dining room, which is open to the kitchen and family room. The kitchen is dreamy and beaming with personality, with arabesque tile backsplash and garden window over the farmhouse sink. The master is filled with light, with windows on three sides. The master bath is fully renovated with marble vanity, pattern tile floor and subway tile. The backyard is a private oasis with fruit trees and roses. 1 block to River Glen park, so close to downtown willow glen, award winning schools, shopping and restaurants. 3 miles to Downtown San Jose and proposed Google San Jose village.